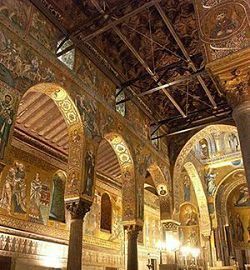 The Palatin Chapel, Cappella Palatina, is the royal and luxurious Chapel of the Norman Kings in Sicily, built in the first and centrale floor of the Royal Palace. The Chapel was commissioned in 1132 by king Roger II, and was built upon an older Chapel, actually the crypt, dating 1080. It took eight years to build it but many more to complete the mosaics and the unique beautiful arab-byzantine decorations. 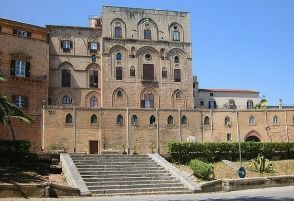 The church is dedicated to Saint Peter and has three apses, typical of Byzantine architecture, with six arches in the central nave, sitting on the classical columns. 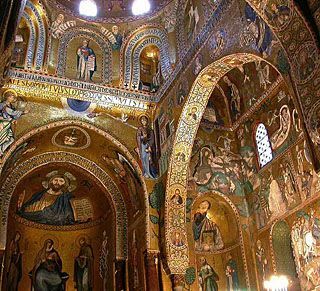 What makes the Palatine Chapel an un unparalleled jewels in the world, is the style and art of its mosaics, the elegance of the figures on the arabian wooden roof, the brilliant colours and luminance. 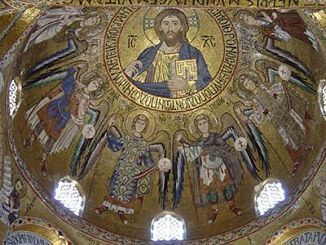 The most ancient and besutiful mosaics are those covering the ceiling, the drum and the dom. 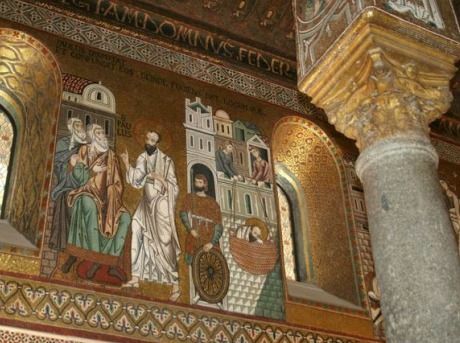 The mosaics of the transept are in Byzantine style dated from 1140s and show scenes from the Acts of Apostles, so are also in latin style. King Roger II let the arabian artists decorate the ceiling in a muqarnas style, very precious and Arabic style. These mosaics are of so great beauty and valuable art, where hundreds of facets are represented and painted, scenes of daily life with animals, flowers and plants, and also some scenes still now not completely explained. Probably influenced by Abbasid Iraqi art, these scenes and paintings are innovative and therefore presents Characters and animals in a more realistic way. 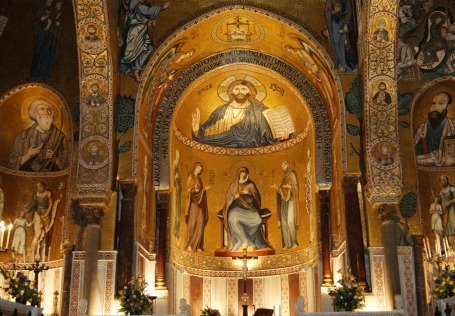 The other mosaics, from 1160s to 1170s, are realized in less sofisticated way style, and have Latin and Greek elements. The scenes are more narrative than spiritual, and few mosaics about flora and animals are typically of byzantinian style. So that the Chapel represents a very elegant harmony of styles and different religions: Norman architecture and décor, Arabic Arches and scripts embelling the roof, Byzantine style in the mosaics and dome. The Carolingian Throne is very important as well, it was a set stage for royal reception, with his balcony which permitted the king to see the religious events from there, in a central focal position. The room of king Roger II, with its decorations of mythological scenes and performing animals, such as the famous centaur, peacocks, leopards, swan and deer, are surrounded by natural and rich vegetation. They are a sort of representation of the philosophy of the King. The Palatine Church from 2002 and 2008, has been restored thank to big contribution given by the German Reinhold Wurth. The Chapel has been considered in all times, for its differents spiritual and religious features, ‘’the most beautiful Church in the world, the most surprising religious jewels dreamed by human thought’’.